A realtor with Howard Hanna recently submitted information to the school board that outlines 850+ proposed new homes located in the North Allegheny School District. 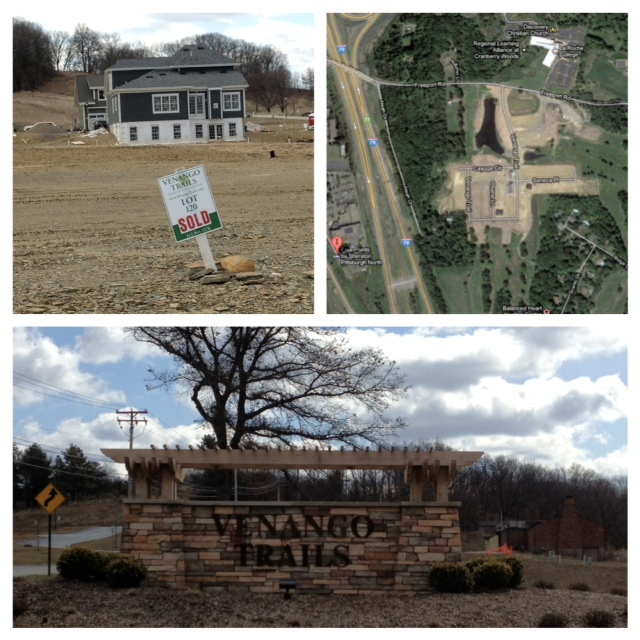 One of those developments is Venango Trails, which is located in northern Marshall Township. Based on the administration’s March 20th presentation to the school board, Marshall Elementary will only have 2 spare classrooms after students are redistricted from the closure of Peebles Elementary. With many classrooms operating close to district guidelines, the two spare classrooms at Marshall Elementary could be utilized by adding just a few new students to the building. The administration has not addressed how it will accommodate the large amount of growth projected from the Venango Trails development. Based on the district’s records, elementary enrollment has increased over the last several years. Based on the district’s records, there are currently 13 elementary sections operating above the district’s class size guidelines. This has created “empty classrooms” across the district. At the school board meeting on March 20th, the administration said it would need to add 10-14 elementary sections next year to keep class size below district guidelines. 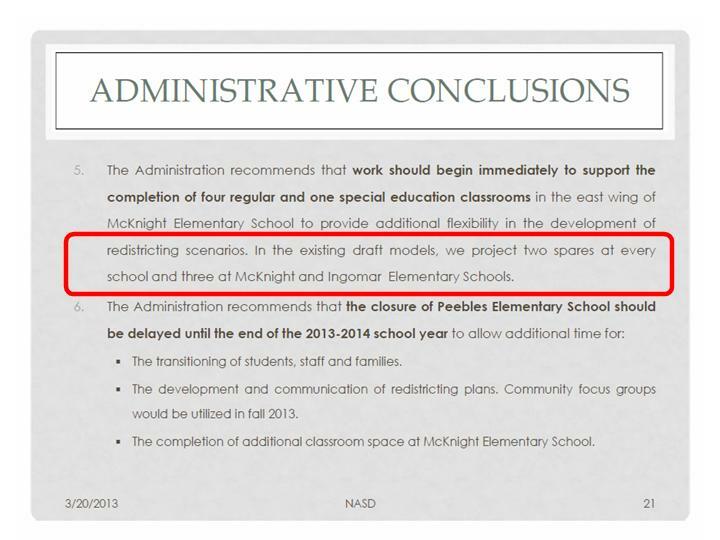 Based on the administration’s March 20th presentation, there are only 14 spare classrooms if the district expands McKnight and closes Peebles. Based on information obtained from local developers and realtors, new housing developments across the district are projected to add 850+ homes to the area. 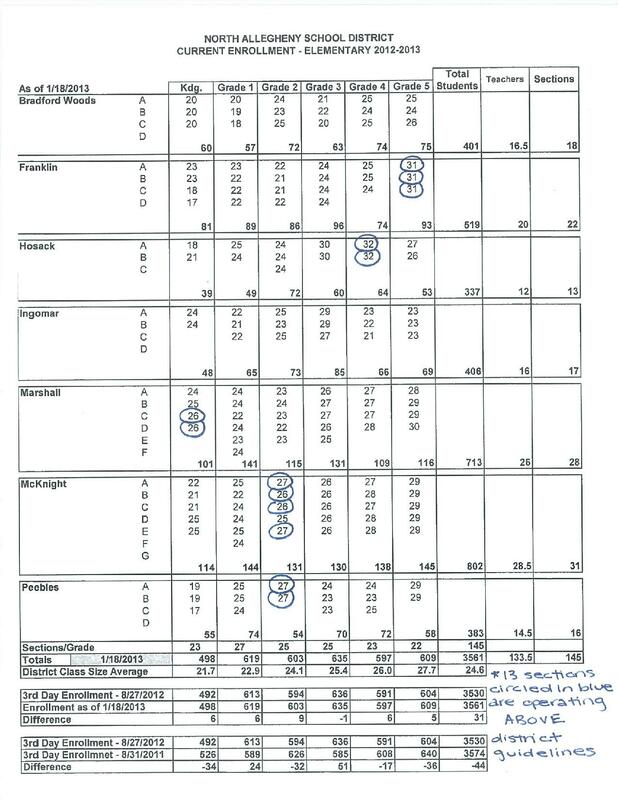 If the administration needs to add 10-14 sections to keep elementary class sizes below the district’s guidelines, and only 14 spare classrooms are available after the district expands McKnight and closes Peebles, the remaining buildings would be left with no spare classrooms if class size is held within the district’s guidelines. Elementary enrollment has increased over the last several years. The district does not have enough classrooms to keep elementary class sizes below the district’s guidelines if a building is closed. New housing developments are projected to add 850+ homes to the district. If the board votes to close a building, the district will be wed to higher class sizes both now and in the future. The administration has recommended adding 5 classrooms (four regular and one special education classroom) to McKnight Elementary to address the issue of class size. However, the “new recommendation” does not provide enough spare classrooms to keep class sizes below the district’s guidelines. If Peebles is closed and 5 classrooms (four regular and one special education classroom) are added to McKnight, only 14 spare classrooms would remain across the district. This is taken from the administration’s presentation on March 20th which shows three spare classrooms at both McKnight and Ingomar and two spare classrooms at each of the four remaining buildings. To keep class sizes below district guidelines, the administration said it would need to add 10-14 elementary sections next year. This assumes a class size cap of 29 students for intermediate grades and 24 students for primary grades. If third grade is treated as an intermediate grade, the district would need to add 10 elementary sections. If third grade is treated as a primary grade (like it is at Pine Richland), the district would need to add 14 elementary sections. Thus, the district would have to utilize all 14 of the spare classrooms available under the new recommendation in order to restore class size to 2009 levels (when the district offered 158 classes to 3,500 students). This means no spare classrooms would remain if a building is closed. As previously noted, elementary enrollment has increased over the last several years. The district has allowed class size to go above district guidelines, thereby creating “empty classrooms,” by only offering 145 sections to our 3,560 elementary students. If a building is closed, the district will be wed to higher class sizes both now and in the future. Given there are several new housing developments across the district, which are projected to add hundreds of elementary students to the system, the “new recommendation” has the same class size issues as the original recommendation. As noted in last week’s post, elementary enrollment has increased since the start of the school year. Peebles and McKnight, which are not situated next to new housing developments, have seen the largest increases. Thus, the new developments listed above would be in addition to the growth the district is currently experiencing. Based on the February demographics meetings at each elementary school, the administration said it only expects to have 10 spare classrooms if students from Peebles are redistricted into the 6 remaining schools. This means some schools would only have 1 spare room available to manage class size. 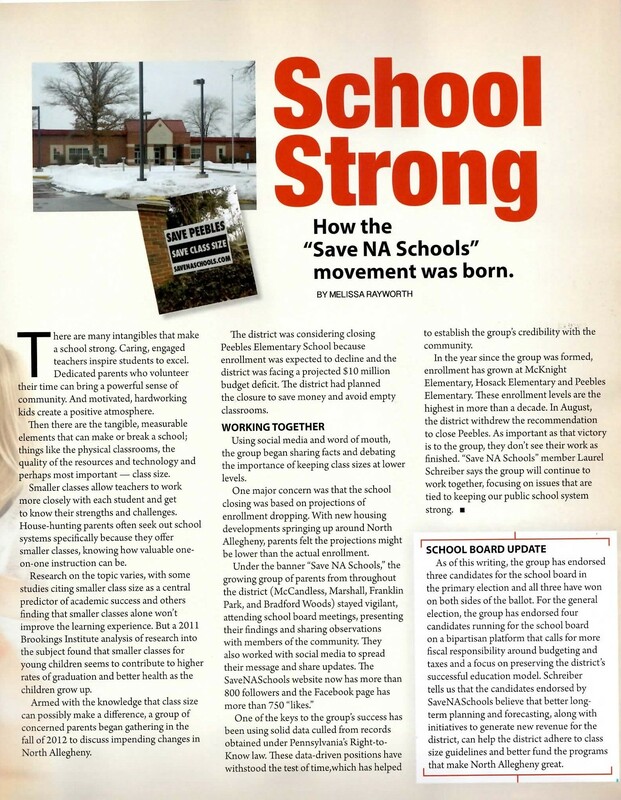 If Peebles is closed, the district would continue to experience 30+ students per classroom or displacement of programs integral to the elementary curriculum, such as music, ESAP, and GOAL.